Much more than just a charger. Its great to see a product that works really well! Its a true delight to get to write such a positive report. This charger will charge/desulfate/ and maintain any 12 battery from gel cell jump packs, to AGM spiral cells, to car, truck and RV batteries and will actually restore them to a higher capacity as well as make them last much longer. For 24 volt applications you can use two of these chargers. I run a battery shop for a large maintenance facility and since we started using these products several years ago, we continue to save thousands of dollars every month using Pulse Tech chargers (bigger commercial units using the same technology). This is the only charger I have found that actually breaks up the lead sulfate crystals -which form on the lead plates when a battery sits at a less than full charged state. (All lead acid batteries do this). Its these deposits of lead sulfate crystals that keeps the battery from delivering current and excepting a full charge. I have 3 of these chargers at home- they come in dif ferent colors (red, yellow, green and blue and a dual charger version). They are all electronically the same so buy the cheapest one you find. I've used this product for several years now and it's the best charger I've ever owned. I originally bought it to maintain my motorcycle battery. I use my motorcycle mostly for track days now so I don't ride it as often as when I commuted on it. Because of this, I had to replace a very expensive AGM battery. Rather than having to replace expensive batteries, I put my bike on a trickle chager. Originally I tried to get away with a cheaper type. I used a battery tender junior (which I bought from amazon). It died after a day of use. I figured it was defective and I had it replaced. It also died. Given the rock solid ratings and review, I figured, I must have done something wrong. I talked to their customer service and on my 3rd try on that charger had it "maintain" a new battery with a full charge. It also died. I gave up after that and switched to this charger. This charger has worked flawlessly over the past few years. The indicator lights give me all the infor mation I need regarding the health of my battery. It doesn't overcharge the battery or reduce battery life. 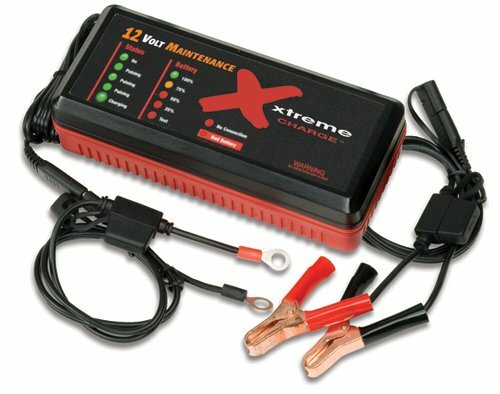 I now use it also on my deep cycle batteries on my boat (3 of them). I basically cycle this charger and move it from battery to battery every few weeks. I've used this thing non-stop for at least 2-3 years now. It is also water-resistant (proof? ), and I have no problem leaving charging my boat even if it's raining outside. It also doesn't get hot at all like many other chargers. The only drawback to this unit is is $100 bucks vs. $25 for other chargers. However, I personally believe it's well worth the money. If you check the specs, all the models are the same charge capacity, except for color of plastic and labeling. So buy the cheaper one! Have two differant ones, and both identical ratings, and charge the same in real time.